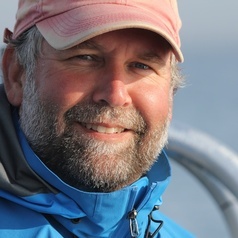 Dr. David W. Johnston is an Assistant Professor of the Practice of Marine Conservation & Ecology at Duke University. Johnston holds a PhD from Duke University and received post-doctoral training at the Monterey Bay Aquarium Research Institute in California. His professional experience ranges from leading research programs for NOAA to working as an ecologist within the NGO sector. Johnston’s research program focuses on the ecology and habitat needs of marine vertebrates in relation to pressing conservation issues such as climate change, habitat loss, ocean noise, incidental mortality and overharvests. He has published extensively in top journals in the fields of conservation biology, oceanography, marine ecology and marine policy on research that spans tropical, temperate and polar biomes. Johnston is an innovative teacher with experience in both large and small classrooms, and is skilled in Massive Open Online Courses, field-based learning situations, data visualization and digital textbook development and publication.